I previously wrote about mini pig sleeping habits and discussed how Oscar sleeps quietly through the night aside from his snoring. Although some people might find mini pig snoring disruptive, we love when Oscar snores. 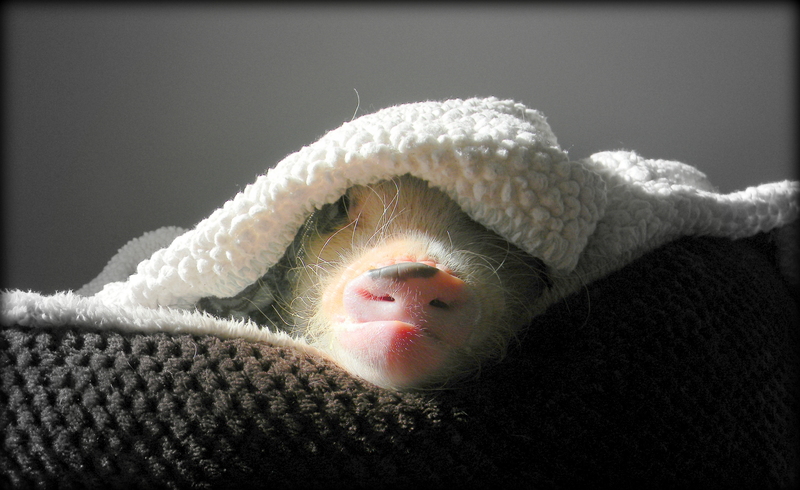 Unlike human snoring which is often loud and choppy, mini pig snoring is smooth and soothing. It sounds like a gentle humming, which is calming at night. When we tuck Oscar into his crate at night, he shuffles around for a minute to get his blankets in place and then goes right to sleep. A few minutes later, he starts snoring. Here is a sound recording of Oscar’s snoring. The gaps have been shortened to keep the sound clip moving. I’m curious to see how Oscar’s snoring changes as he gets older and bigger. For now, I love hearing his sweet, calming snoring sounds. They are comforting and reassure me that he’s safe and content, enjoying his sleep.